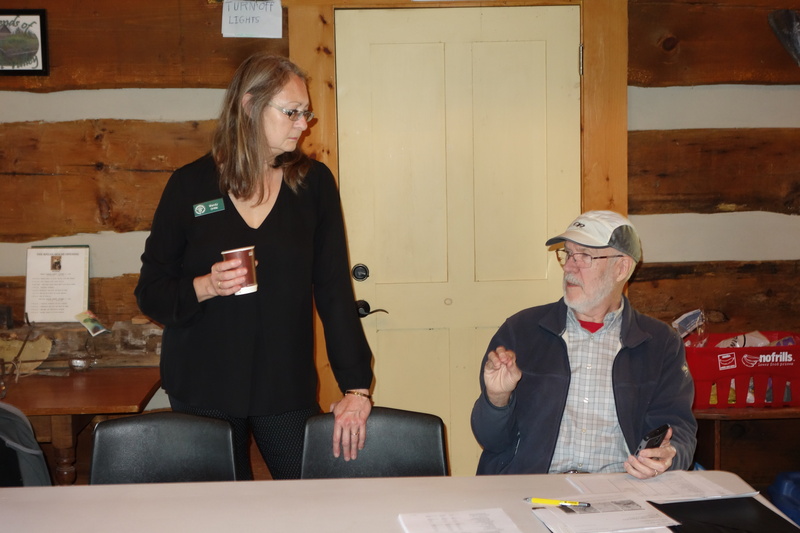 Laura and John Giffen (daughter and father) have offered to take over the leadership role for the Ganaraska Mad River Hiking Club as co-presidents. 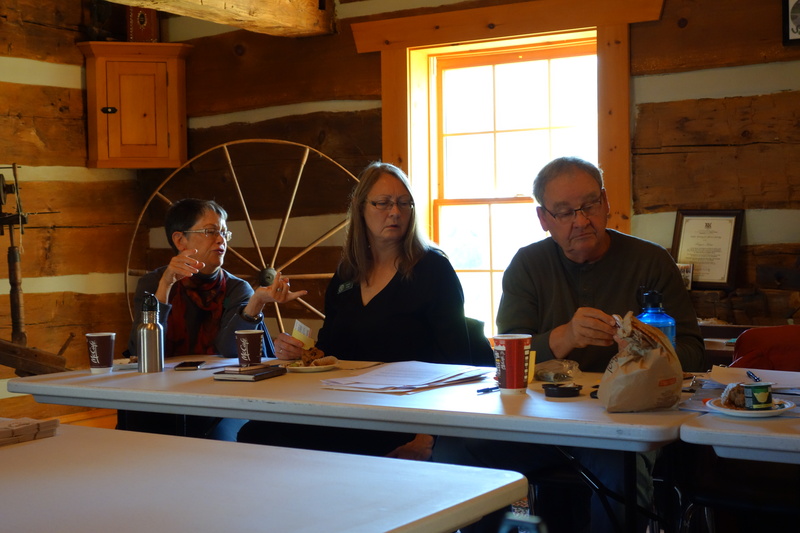 The Giffen family owns Giffen Farm and Giffen County Market in Glen Huron and bring a lot of enthusiasm and vision for promoting hiking in the area to the role. This is effective immediately, but I will remain involved as long as Laura and John feel is necessary. Welcome to both Laura and John and our thanks to both of them – they are a great addition to the Ganaraska team at both the club and association level. 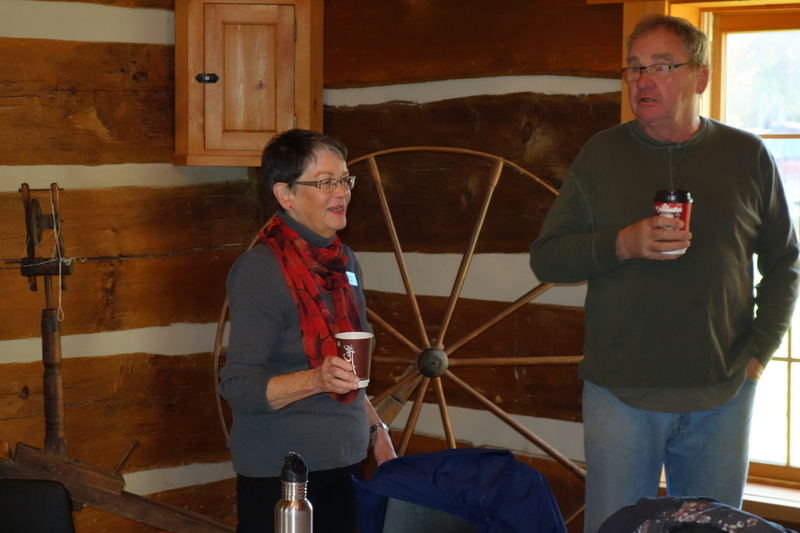 Early February 2019, Bruce Trail and Ganaraska hikers enjoyed a winter get-away at Killbear Provincial Park. Two groups of approx. 40 people each filled up the staff lodge, and took full advantage of everything Killbear Provincial Park has to offer in winter. Cross country skiers loved the 9 km track set trail, and snowshoers hiked all over the park. The scenery was fabulous, with lots of picture taking opportunities. 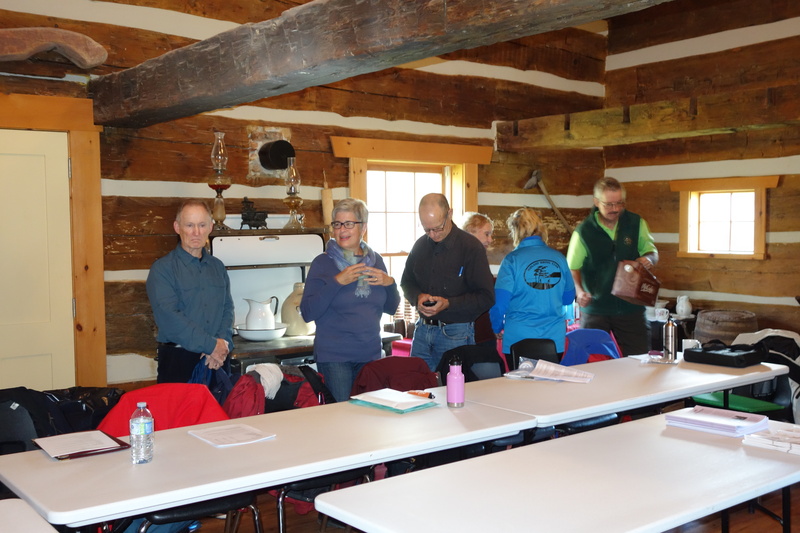 In addition to snowshoeing and skiing, or a simple walk down the park road, the groups enjoyed campfires, games, delicious potlucks, and even a beginner Square Dance lesson on a rainy afternoon! Looking forward to our 10th anniversary visit next February! I would like to thank Carol Strickland for organizing our new venue. 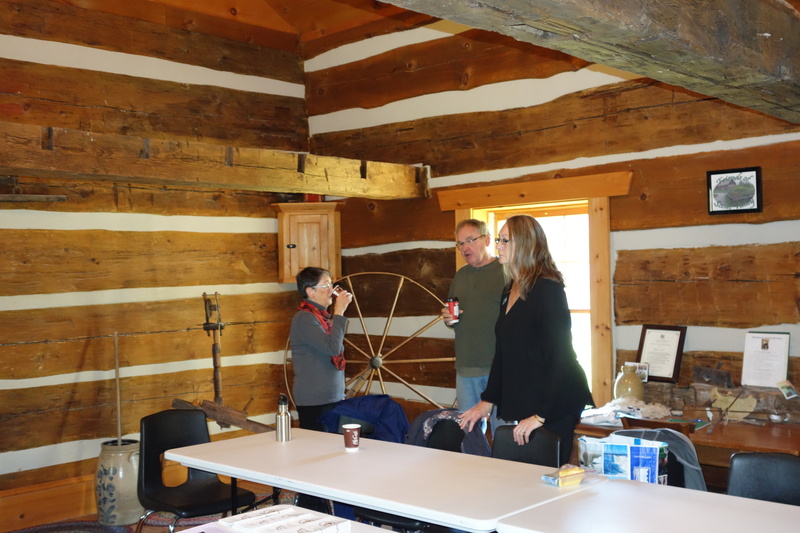 We met in a historic log house situated in Scout Valley near Orillia. This is the first log house I have seen with in floor geothermal heating. Here are a few pictures from the meeting. 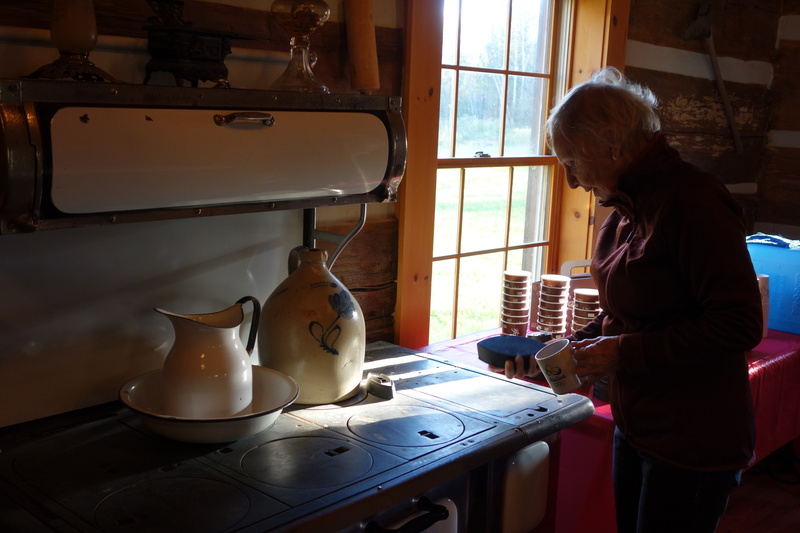 On October 13, 2018, the Ganaraska Trail, Wilderness Club along with Queen Elizabeth II Wildlands Provincial Park staff changed the colour of the blazes on the Devil’s Lake Side Trail from the access point to Petticoat Junction from white to blue today. Also, the occasional blue reflective blazes were installed – great for those needing to make it out after the sun has set (head lamp or flashlight needed). Thanks to all the volunteers who gave a little back to help maintain the trail we all love. 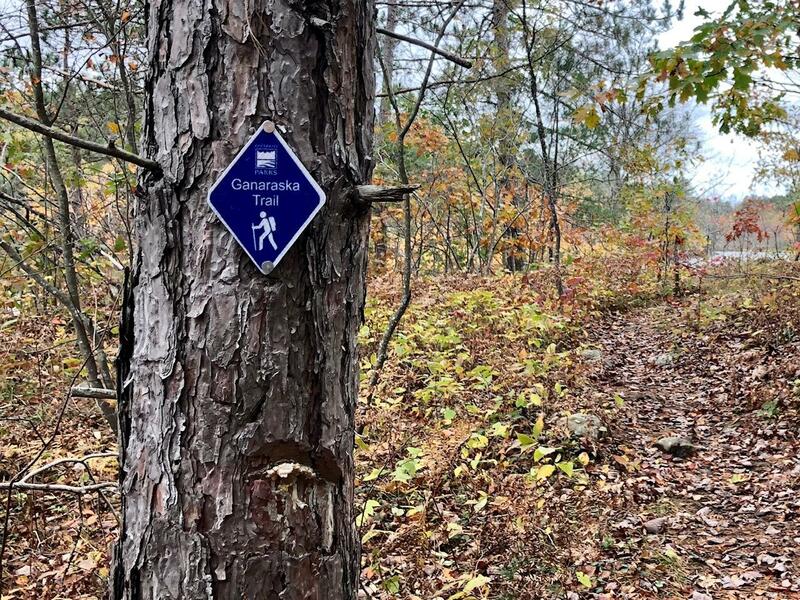 The idea of hiking the Ganaraska Hiking Trail came on the heels of completing the 900Km Bruce Trail in September 2017. What were we going to do next? 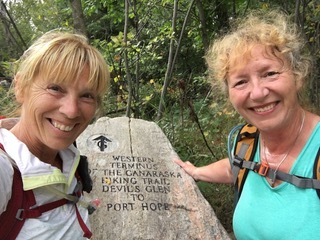 My long time friend and hiking partner Wendy Manning and I were enthusiastic to begin a new challenge together and made a plan during the winter of 2017/18 to hike one one of the most popular trails in England, the Coast to Coast Path, a 305Km epic adventure which we would complete in 12 days in May 2018. The GHT fit right in with our plans, offering a not only new challenge but a commitment to hiking as much as we could ahead of our trip. Being that it was also the 50th anniversary of the GHTA, it also made for a significant achievement to undertake. 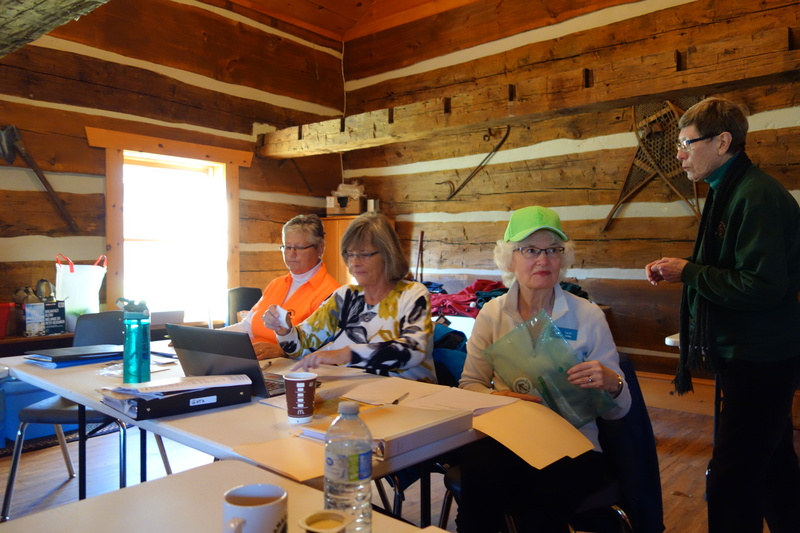 With member, guidebook, and maps in hand, we exuberantly began in Port Hope on March 3, 2018. Pine Ridge was interesting with it’s rolling hills and unique landmarks; the rail trail through Kawartha took us through the towns of Lindsay and Fenelon Falls, along its scenic lakes and streams, very picturesque, but the cool north wind chill and wintery conditions well into April made for challenging hikes. We ran into some trouble in the final section of Kawartha though, painstakingly trudging through very deep snow and had to bushwhack around impassable water crossings in the north end of Corben Lake to get back to the trail; one of many exhausting hikes! Ahead of our trip to England in May we successfully completed 198Km of the trail, including two of the three hikes in the Wilderness section, but due to the water levels, the crossover would have to wait until we returned. We planned to hike the Wilderness crossover in one day. There was little support for this giving the distance, and most people would backpack over a few days. Yet we were determined. We cancelled twice due to conditions, but finally got the opportunity on June 23rd. 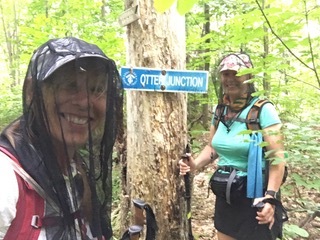 The beaver dams were all passable, as water levels had dropped, but blazes were almost impossible to spot in places, completed shrouded in growth; as was the trail, overgrown with ferns above our heads and thorny shrubs that left our legs shredded and bloodied. The going was slow, stopping often to consult the maps; each time I removed my head netting, the insects would attack with a vengeance. It took 13.5 hours to hike from Devil’s Lake to Victoria Bridge. Our nerves were rattled, and our minds to the point of breaking, but we did it! We got through the most difficult hike ever! By mid July we were back on the trail again, having a renewed interest in continuing now that the worse was over, or so we thought. We took advantage of the two hike weekends by camping: Bass Lake PP, for the Orillia section, Awenda for the Oro-Medonte/Midland/Tiny sections. Over Labour Day weekend we took a cottage for the Wasaga section. We still had the insects to contend with, but we also started notice an abundant varieties of interesting mushrooms in the Simcoe Country Forest Tracts. In mid-August we coined our hike of the Tiny section a “Hike with Monarchs”, such a joy to have them fluttering everywhere around us! Every hike had its challenges: a lot of bushwhacking in very rough terrain and high grasses; heat and humidity that zapped our energy; navigating around countless fallen trees; and of course finding blazes to keep us on course. But with every challenge there were numerous surprises too, always an element of discovery: interesting landmarks, historical areas, beautiful scenery, and quaint communities. 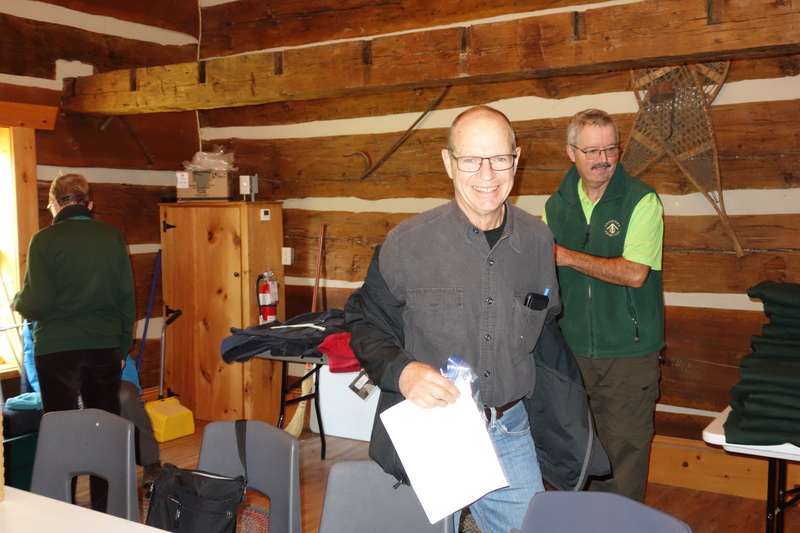 Our final weekend of the GHT on September 8 and 9 proved no less of a challenge. We had 57.3Km to cover to get to the Western Cairn. The last section of Barrie had us crossing a vast section of high grasses for over a kilometer with very difficult to spot blazes. We eventually reached the forest, and to our excitement we finally find our very first Giant Puffball mushroom. The reward was a total thrill. 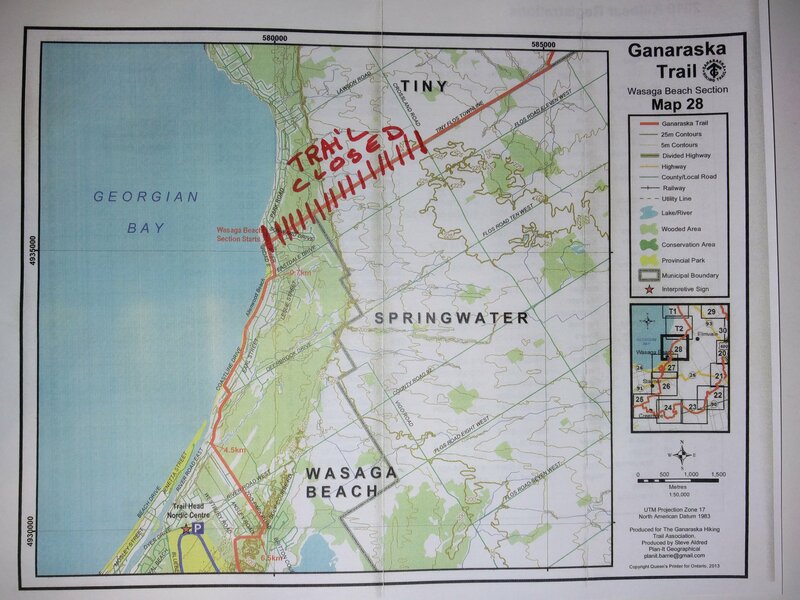 The Mad River section followed a disused rail bed for 10K to New Lowell, interesting at first as it crossed both the Nottawasaga and the Mad Rivers. But it was so overgrown and challenging, we had to continually divert to road to get through it. But then at the end, we discovered a beautiful little trailer park (with facilities!) in New Lowell that brightened our spirits. 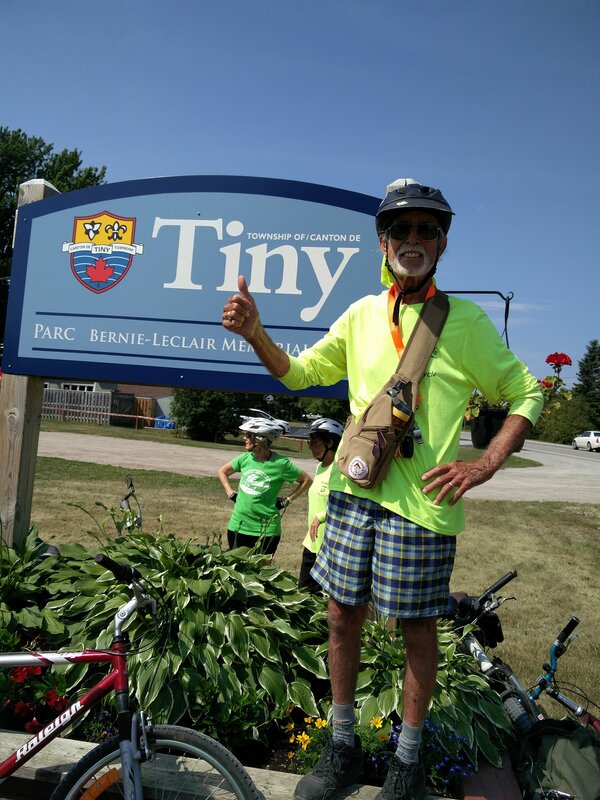 On the final day we ambled through the very scenic town of Creemore, stopping at a café, visiting Canada’s smallest Jail, and admiring a beautiful church; delightful! We knew the challenge was not over. After climbing the 400m Ten Hill with its spectacular views, we descended to an un-blazed field on Concession 6 S. We had to find our way to a tree-line, crossing a creek hidden by the high grasses; it was tasking and slow but we eventually found a place to cross the creek and head to the trees, fallen trees, everywhere. The challenges just kept coming. We did manage to find the blazes and continued through the forest. We would lose the trail once more in this final 5K stretch, but we found our way to Glen Huron, with only the victory climb up McKinney’s Hill to the Western Cairn. We made it! We popped open the champagne, sat on the Cairn and celebrated! We fought this challenge with courage and zest right to the end. There’s no reward better the feeling of accomplishment that comes with having worked through some really tough challenges. 507Km, 18 hikes! An extraordinary journey! July 1, 2018 was so far probably the hottest day of 2018. 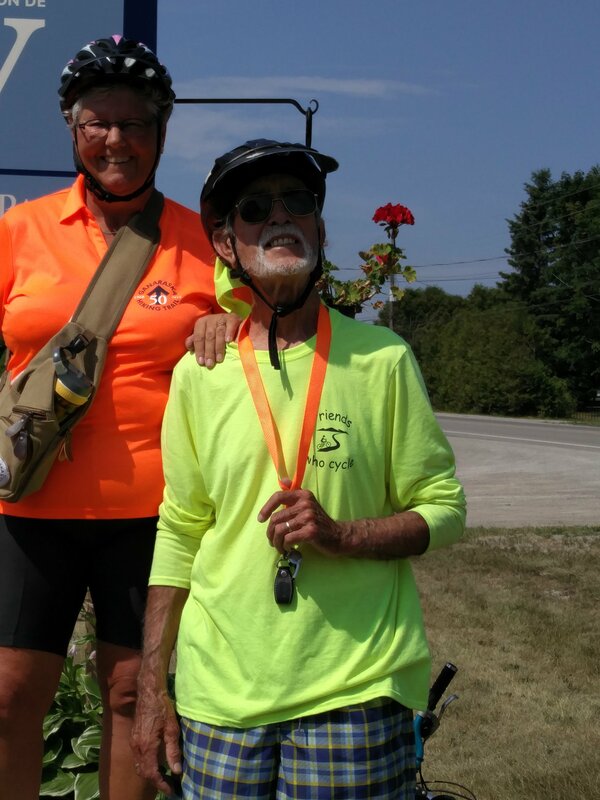 Regardless, 20 dedicated hikers from the Midland Club of the Ganaraska Hiking Trail took part in the Canada Parade in Midland, Ontario. What a bright and colourful group! Thanks to all the hikers who came out to promote the hiking club. Meanwhile, the Ganaraska Hiking Trail display was set up at Little Lake in Midland to try and attract new members. Take a tour of the new Kawartha Club site (www.kawarthahiking.com) here.